Mechanical, electrical, plumbing, and fire protection design services for a new 22,750 S.F. car dealership / service garage. In addition to a sales office and showroom, the building also housed an eleven (11) lift service garage with quick lube and three (3) detail and wash bays. Mechanical, plumbing, and fire protection design services for a new car dealership / service garage. The 33,100 S.F. facility included a show room, sales offices, parts department, a twenty-one (21) lift service garage, quick lube, four (4) detail and wash bays, and an attached carwash. Mechanical system design included a vehicle exhaust system. Mechanical, electrical, plumbing, and fire protection design services for a new 34,800 S.F. 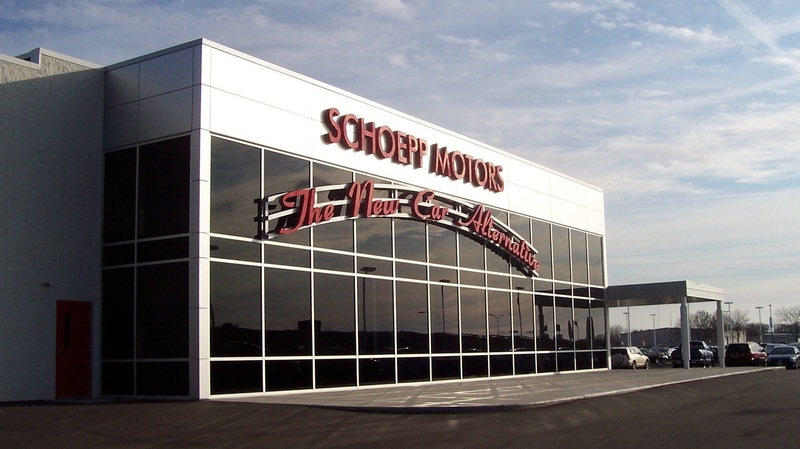 automotive dealership and service garage for Schoepp Motors. This project was designed and constructed in three phases, which placed critical importance on utility and site coordination throughout all phases of the development. The finished project included a 4,000 S.F. showroom and an 8,000 S.F. office area, along with a seventeen (17) bay service garage, express lube and service reception area, four (4) detailing bays, and a three (3) bay vehicle delivery area. Mechanical, electrical, plumbing and fire protection design services for a new 30,700 S.F. truck maintenance and service garage facility. The project included a 13,300 S.F. office, parts department, and driver lounge / sleeping quarters space. The 17,400 S.F. service garage included three (3) depressed lube pits and ten (10) semi-tractor maintenance bays. The project also included a fuel island and tractor and trailer wash bay. Electrical system design included a new generator and transfer switches and incorporated a 40 kVA UPS system.